Sausage, eggs, and hasbrowns. Grilling and potato salad. Burgers and fries. Steak and baked potatoes. Notice a common theme here? There’s a reason it’s known as a ‘meat and potatoes’ kind of thing. The two just go hand in hand. Seriously. Can’t you just picture them, hand in hand happily skipping down the aisle in wedded bliss? Curiously, I don’t ever really hear anybody spilling the beans on the seasonings that make the match. For us, it’s a bit of pesto tossed with our potatoes, and then cooked until they’re crunchy and, well, crunchier. 1. Scrub and wash the potatoes, pat dry, and (leaving the skins on) roughly chop them up into ‘chunks’. 2. Place the cut potatoes in a large zip-locking bag. Add the pesto sauce to the bag as well, seal, and shake everything around until all of the potatoes are evenly coated. 3. 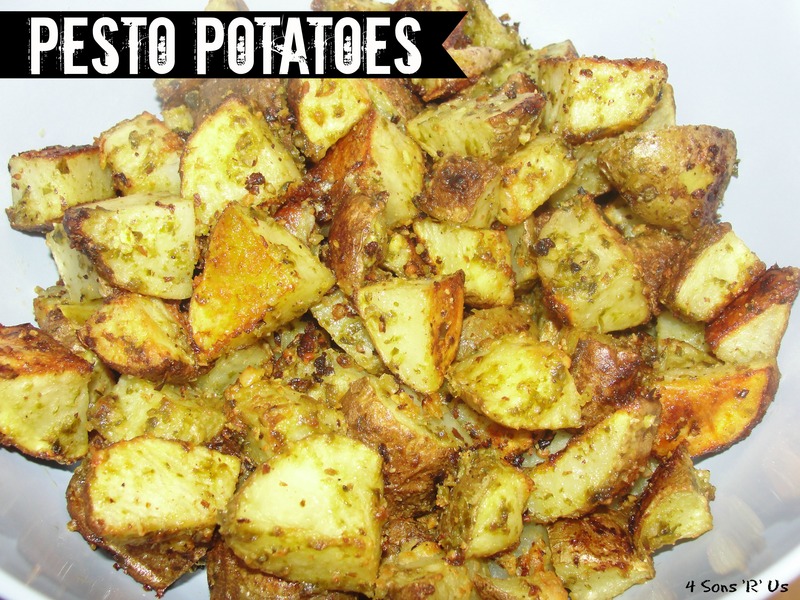 Pour the pesto potatoes out onto a baking sheet and spread them out evenly. Sprinkle the Parmesan cheese over top. 4. Bake at 450 degrees for 25-30 minutes, or until potatoes are golden.